Eldoret North MP William Ruto has become the first presidential candidate to shade light on his personal wealth. Declaring ones wealth is one area of Kenyan politics that usually smacks more of a PR stunt than an actual desire to inform the voting citizenry of the politician’s personal wealth. But William Ruto has done it with such earnestness and transparency that one is inclined to believe that the URP candidate has a made a proper and thorough accounting of his wealth which is estimated to be in the hundreds of millions. Ruto’s has always claimed that he is a self-made man who dragged himself up by the straps of his own boots and that his personal wealth has always been a matter of public knowledge. “I can account for every coin that I have. My wealth declaration forms are available for scrutiny. I have paid mortgage since 1996, sometimes two or three mortgages for whatever properties I own. The records are available from the financial institutions and banks. I have painstakingly bought shares in companies including some that I have built up from scratch through sheer had work. The records for these are also available,” said Ruto. Ruto, the probable URP presidential candidate, said he can show how he legally acquired every property and business he owns today and dared anyone with contrary information to take him to court. Ruto wondered why questions were now being raised about his wealth yet in 2007 he helped to raise half of the fund for the ODM party and its presidential candidate Raila Odinga. Ruto’s image of a man who was born in family of parents who were not well to do is one which he has always been keen to cultivate since it endears him to the man on the street. Add to that the image of a man who is also God fearing and you have yourself a presidential candidate who appeals to almost every demographic in the country. Ruto, Jushua Kulei and others were sensationally acquitted in April 2011 of defrauding Kenya Pipeline Company of KSH272 million in land purchase deal that Ruto had reportedly gotten KSH 96 million from. With this is mind, Ruto has also refuted the rumours that he acquired his wealth through corrupt dealing and urges anyone with evidence to the contrary to come forward with it. “If I had acquired anything illegally with the kind of ‘friends’ I have, I surely would be rotting in jail. Many people believe erroneously that you must be poor merely because your parents were. Some say ridiculously that there are people who were born to be poor. That is the gospel according to the devil,” said the MP. 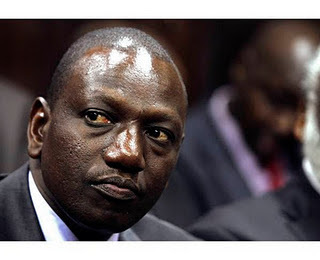 Ruto owns Amaco Insurance which is one of Kenya’s most popular insurance companies and also believed to have substantial interests in the transportation industry. Ruto maintains that he can trace every coin of his wealth and that most of it, especially his real estate assets such as the apartments on Jogoo road that cost him KSH 60 million to build and his palatial home and flats in Ongata Rongai were the results of loans that he took from lenders like Housing Finance Company and Bunge Sacco both of which institutions he has now fully paid back. Ruto’s announcement about his wealth comes on the heels of an announcement by the chairman of the Independent Electoral and Boundaries Commission, Isaack Hassan that the commission will take the issue of investigating the campaign funding of the aspirants very seriously. “I am determined to run for President because I understand what hustlers go through and can assemble the will to give a real chance to the ordinary Kenyan to be something. This election we will prove that even the children of paupers can be something in Kenya,” said Ruto yesterday. Longombas Collabo With Mr Vegas.